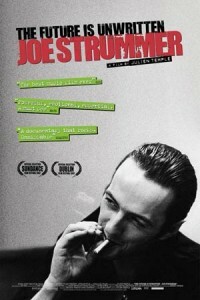 “Joe Strummer” – As the front man of the Clash from 1977 onwards, “Joe Strummer” changed people’s lives forever. Four years after his death, his influence reaches out around the world, more strongly now than ever before. In “The Future Is Unwritten”, from British film director Julien Temple, “Joe Strummer” is revealed not just as a legend or musician, but as a true communicator of our times. Drawing on both a shared punk history and the close personal friendship which developed over the last years of Joe’s life, Julien Temple’s film is a celebration of Joe Strummer – before, during and after the Clash.